Your login information (email address and encrypted password) for your Candidate Portal. Help You manage Your job opportunities : when You apply, You have access to a Candidate Portal, where You can find Your profile information and applications information and receive jobs suggestions. In this case, we are the data controller. Help our customers (“Customer”) find their next hires : when You apply, our Customer (the recruiter or hiring manager) can consider You for any job opportunities they have and can use any SmartRecruiters tools to track, manage and make a decision. In this case, the Customer is the data controller. Because SmartRecruiters and its affiliates (“SmartRecruiters”) offer You real choice and control over how You use Your Personal Data, and wants to build trust and engagement with You, consent is the legitimate basis for processing Your Personal Data. 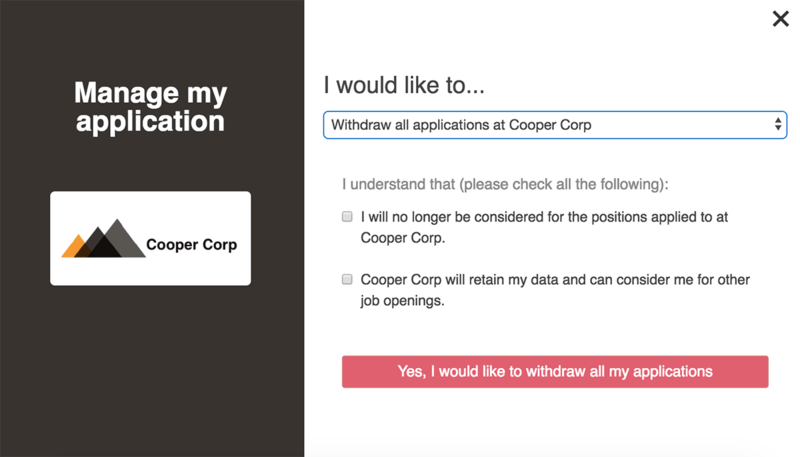 You can withdraw Your consent at any time by either withdrawing Your application or deleting Your profile. Learn more here. SmartRecruiters is not a headhunting company. We only provide a talent acquisition technology to our customers and the services to You as mentioned above. You can set up a personal account (“Candidate Portal”) which allows You to manage Your job opportunities and track your different applications of several Customers. In Your Candidate Portal, which is accessible on https://my.smartrecruiters.com/, You may register through the email you received after applying, or if your consent was requested. This is operated by SmartRecruiters under its own responsibility. The registration requires your email address and a password. In order to provide world-class services to You and the Customer, SmartRecruiters uses third-party providers to help perform statistical analysis, technical support and data hosting. To learn more, click here. Your Personal Data might be transferred to a third-party vendor with whom the Customer has a relationship with (for example, in the case of an assessment, video interviewing, onboarding, etc.). The responsibility to comply to the Data Protection laws falls on the Customer, not SmartRecruiters. Your application information will be collected by SmartRecruiters and be made available to You through the Candidate Portal. You can find more details here. SmartRecruiters will never sell, rent, or lease the collected Personal Data. Right to rectification: You can modify Your profile by going to the “My SmartProfile” section. Right to be forgotten: You can withdraw and delete Your profile at each company You applied for. Right to data portability: You can export Your profile in a machine readable format. Right to restriction of processing: Your Personal Data will be used solely for the purpose of recruiting and You can decide whether or not You create a candidate portal account to help You manage Your applications. SmartRecruiters, Inc. adheres to the EU-U.S. Privacy Shield Framework and the Swiss-U.S. Privacy Shield Framework. You can find more details here. SmartRecruiters may also contact You via surveys to conduct research about Your opinion of current or future SmartRecruiters functionalities and user experience. SmartRecruiters may use the Personal Data to improve and develop its services and products to the extent this is necessary. SmartRecruiters does not sell, rent or lease the collected Personal Data to third parties. SmartRecruiters may share Your Personal Data with trusted partners in order to perform usage statistical analysis, customer support, technical operations and provide data hosting services. Our trusted partners are prohibited from using Your Personal Data except to provide these services to SmartRecruiters, and they are required to maintain the confidentiality of Your Personal Data. For more information, please click here. Our Customer may opt in to use features that assist them in the recruitment process through automated means. For You, this means that Your application is processed and analyzed to identify relevant aspects from Your work history such as previous positions and employers, education history, demonstrated skills, and duration of work. These aspects are then compared against the job published by our Customer to indicate how Your application corresponds with the requirements outlined in the job listing. A Customer may decide which data retention period they observe for each country to comply with its legal obligations (for example, if they are required to retain Your Personal Data to comply with applicable local laws) and resolve disputes . SmartRecruiters adheres to the Privacy Shield Principles for all onward transfers of Personal Data from the EU or Switzerland and complies with applicable data protection laws. SmartRecruiters uses a limited number of third-party providers in US and in Europe to help to perform usage statistical analysis, customer support and technical operations and provide data hosting services. Amazon Web Services, Inc. is used for hosting of the data. Hosting location is the cluster AWS Germany. SendGrid, Inc. (US) is used to power the sending and receiving of emails from our talent acquisition platform to You and our Customer. Textkernel B.V. (The Netherlands) is used to parse the Candidate’s CV and documents and parse the data into the database field. SmartRecruiters shall remain responsible in case of onward transfers to third parties. SmartRecruiters shares the Personal Data with these third-party providers to support SmartRecruiters’ Services only. Any other use of the Personal Data by third-party providers is prohibited. All third-party providers receiving Personal Data from the European Union and/or Switzerland agree to (i) process the Personal Data only to the extent required by SmartRecruiters’ Services and in accordance with SmartRecruiters’ instructions and (ii) comply with the applicable data protection laws for transfer and processing of Personal Data and (iii) provide adequate technical and organization measures to protect the Personal Data. To this end, we use the European Standard Contract clauses (http://ec.europa.eu/justice/data-protection/international-transfers/index_en.htm) with our sub processors in order to guarantee the privacy and the security of Your Personal Data. SmartRecruiters uses industry-standard technologies when transferring and receiving consumer data exchanged between SmartRecruiters and third parties to help ensure its security. SmartRecruiters’ website has security measures in place to protect the loss, misuse and alteration of information. SmartRecruiters may disclose Your Personal Data, without notice, only if required to do so by law or in the good faith belief that such action is necessary to: (a) conform to the edicts of the law or comply with legal process served on SmartRecruiters or the site; (b) protect and defend the rights or property of SmartRecruiters; and, (c) act under exigent circumstances to protect the personal safety of users of SmartRecruiters, or the public. If You have any queries related to one of Your application for our Customer, please contact them directly. 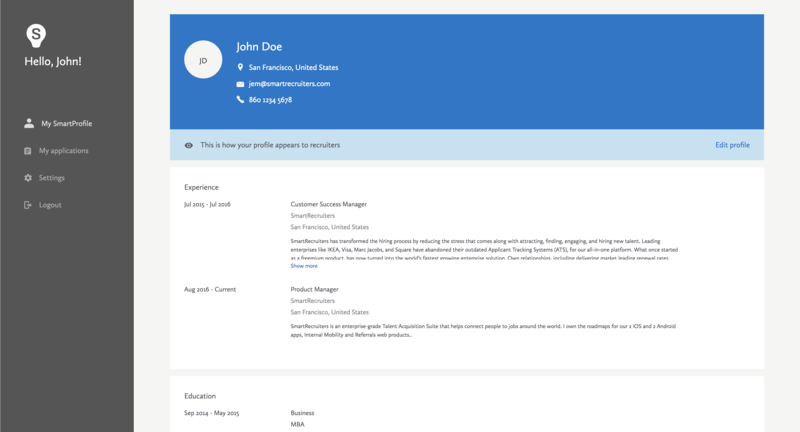 You will find the Customer’s contact showed in the Candidate Portal. If You have any further queries, please send an email to: at: . SmartRecruiters will respond in a timely manner.